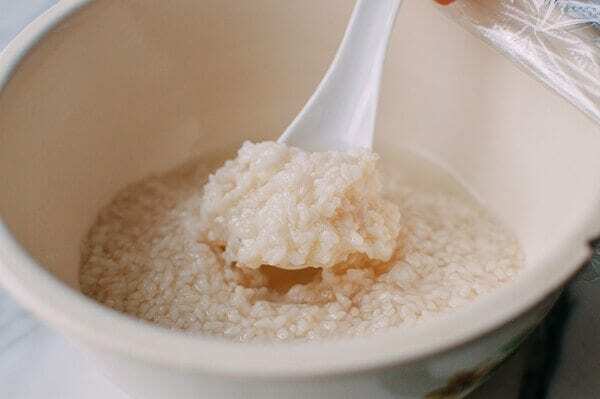 Sweet Fermented Rice, or jiu niang (酒酿), also called Sweet Rice Wine, 甜米酒 (tian mi jiu) has numerous other Chinese names depending on what part of China you are from: 醪糟 (lao zao) ,米酒 (mi jiu), 甜酒 (tian jiu), 糯米酒 (nuo mi jiu), 江米酒 (jiang mi jiu), and 酒糟 (jiu zao). It’s made with sweet rice (AKA sticky rice, or glutinous rice) that is fermented with a distiller’s yeast we call 酒曲 (jiu qu) in Chinese. 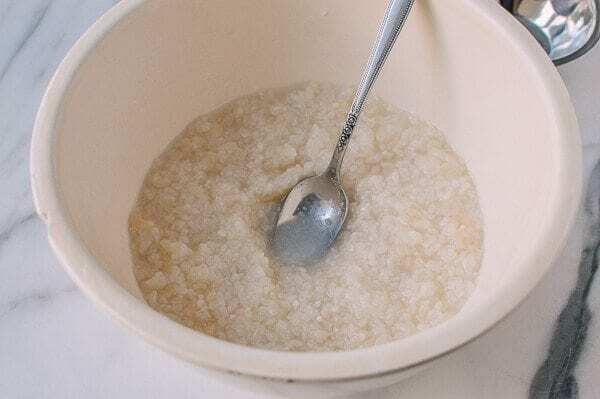 Growing up, elders would school us young kids on the health benefits of sweet fermented rice––its ability to “warm your insides” and improve blood flow. 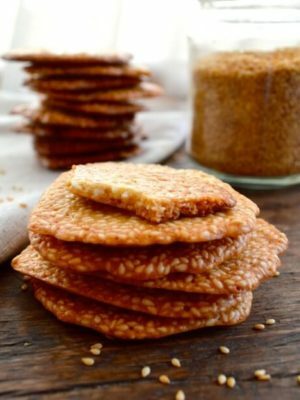 After a little research, it turns out that sweet fermented rice may have many similar health benefits as yogurt, but it’s dairy-free! 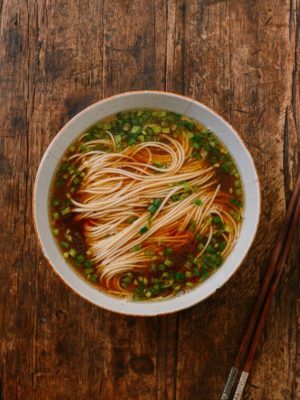 Some say it acts as an anti-inflammatory, aids in digestion, and is prized as a home remedy for recovering new mothers and for women during “that time of the month.” In the bone-chilling winter months, I find a hot porridge of sweet fermented rice can really help keep you feel strong and energized. 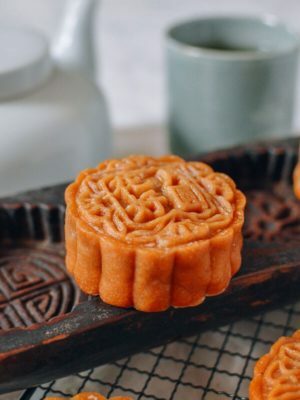 So it’s not hard to understand why this thousand-year-old food item has survived as a beloved food today and how culinary applications range from sweets to breads to famous savory dishes like Braised Pork Belly with Sweet Fermented Rice (酒酿红烧肉). 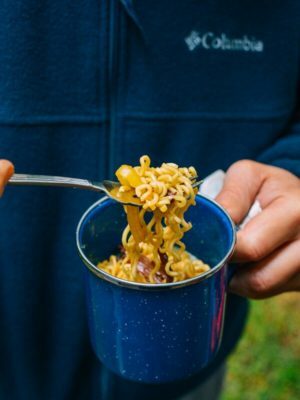 I know plenty of people who love it plain by the spoonful, too! 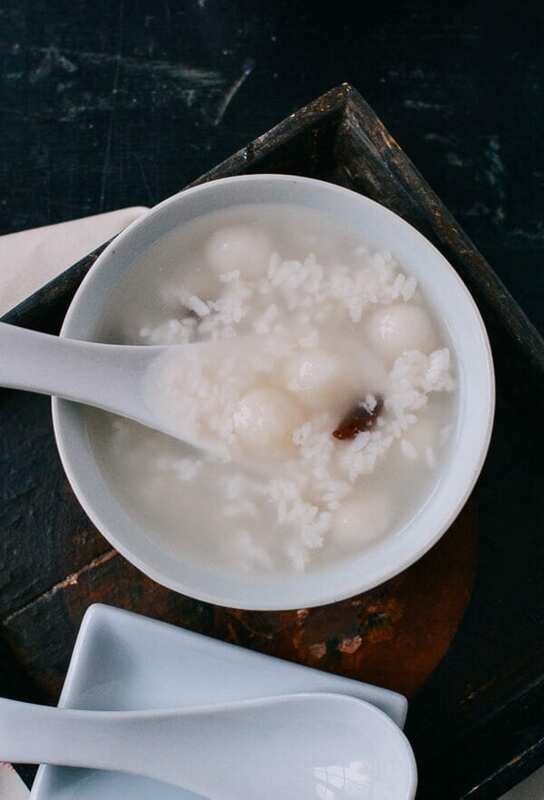 In the photos for this sweet fermented rice post, we served it simply with some sweet glutinous rice balls as a light dessert. 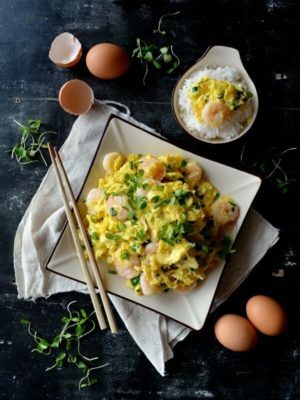 For a breakfast or dessert, you can add it directly to a bowl with cooked sticky rice balls and/or a poached egg. 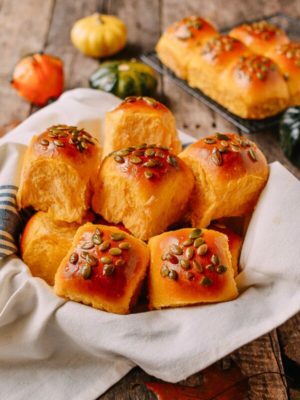 For sweet breads or Asian buns, use the sweet fermented rice to replace part of the yeast and sugar, depending on the recipe, giving the dough a refreshing, sweet, and aromatic wine flavor. 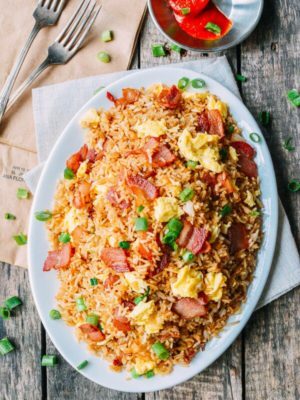 For savory dishes, use the sweet fermented rice to replace sugar for a balanced natural sweetness. 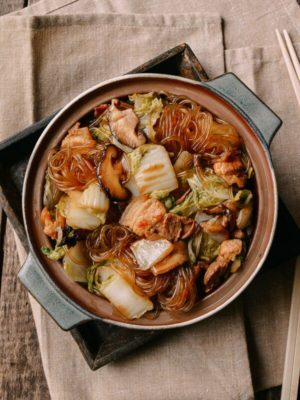 It’s especially good for savory braised dishes like braised fish and pork. 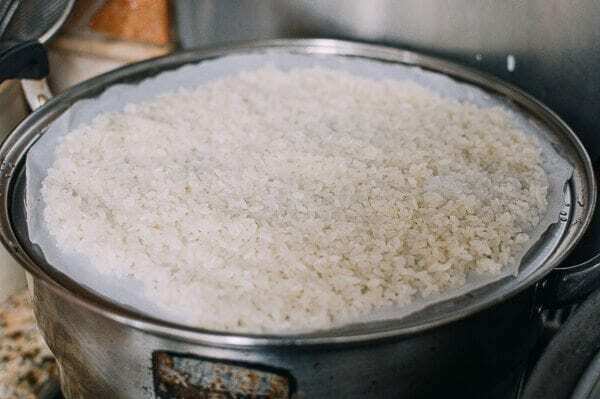 Everything that comes in contact with the sweet rice (before, during and after) must be clean and uncontaminated; otherwise, mold will develop and you will have to discard the whole batch. The fermentation time is much shorter (24 to 48 hours) in the summer vs. in the winter, when it can take days. The best fermentation temperature is somewhere between 80-85F. To dissolve the Chinese distiller’s yeast or jiu qu (酒曲), use warm (not hot!) water in the wintertime and cold water in the summertime. I made this batch in December, and the fermentation took six days. There’s no need to completely dissolve the distiller’s yeast. 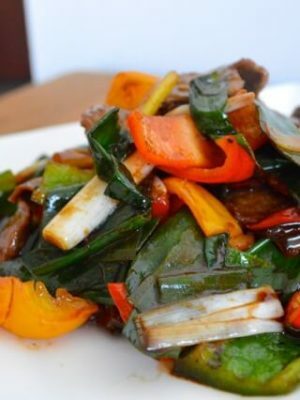 It will blend with the sweet rice well enough during preparation and fermentation. Fermentation needs to occur in a warm place (e.g., near a furnace or under a thick blanket). Use clear plastic wrap or a clear glass cover so you can check the fermentation process daily without exposing the rice to oxygen. 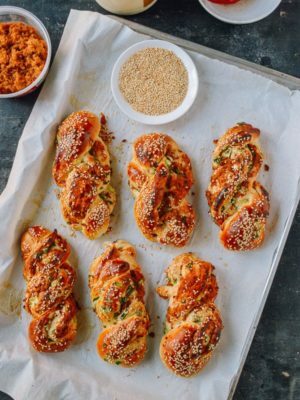 With Chinese New Year approaching, pre-make a batch for when family is visiting and you’re busy cooking up a storm for the big Chinese New Year’s Eve feast! 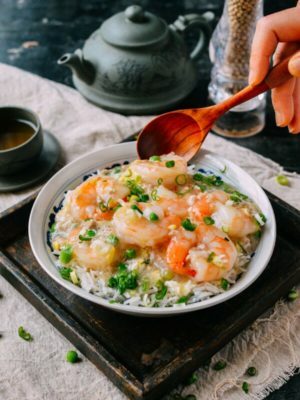 Wash the sweet rice a couple of times, and then soak in cold water overnight in a clean glass or ceramic bowl. The water level should be two inches above the rice to leave room for the rice to expand. The next day, drain off the water. Arrange the soaked sweet rice in a thin layer on a plate lined with parchment paper. You can also put the parchment directly on the steaming surface. Steam for 30 minutes until all the rice grains turn transparent. Remove from the heat and cool. 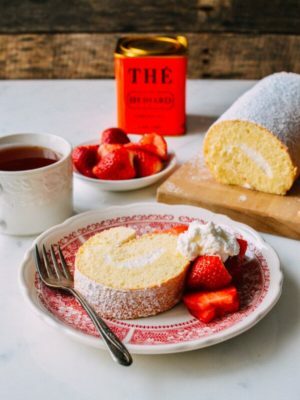 Grind the distiller’s yeast in between two layers of parchment paper with a rolling pin, then mix it in with ¾ cup warm water. 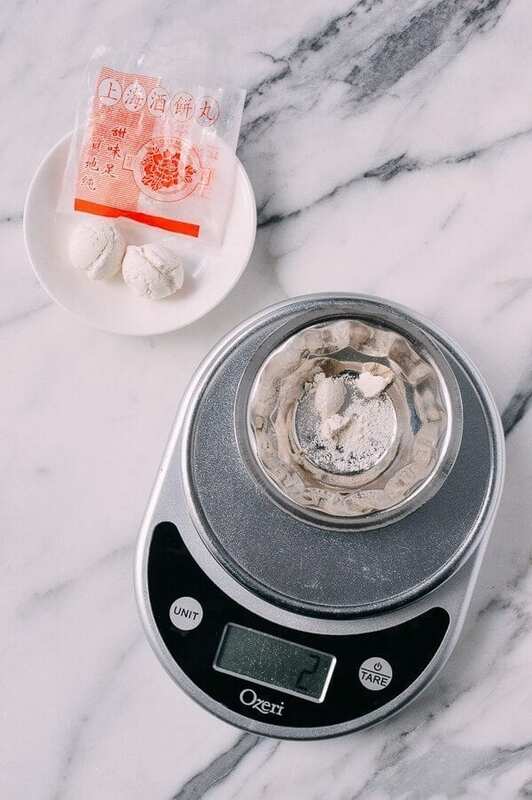 Use your kitchen digital scale for best results! 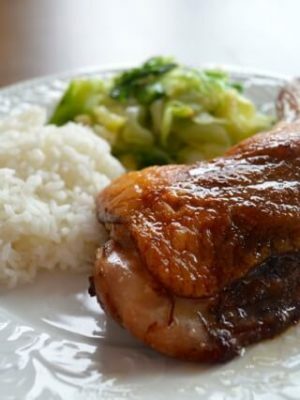 Once the steamed rice is cool to the touch, pour the yeast mixture over the rice. 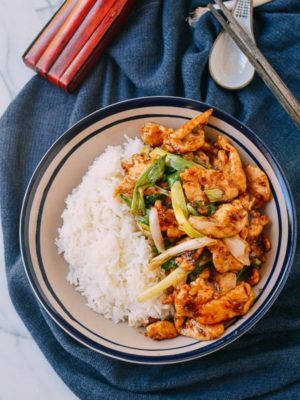 Stir well to combine everything, level out the rice, and create a crater in the center. Tightly cover the bowl with clear plastic wrap, place it in a warm place in the house to start the fermentation process, and check it daily! The fermentation process will be complete when the liquid or resulting rice wine is at the same level as the rice. Also, the rice will look mushy and joined together as one mass. 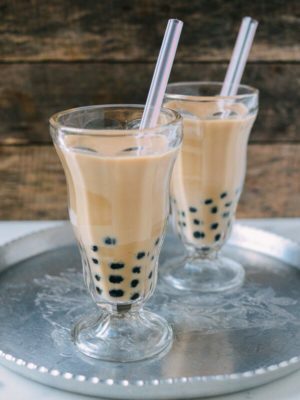 Visible bubbles in the rice wine is normal. When you can detect all of these signs, it’s time to lift the cover and have a taste using a clean spoon. 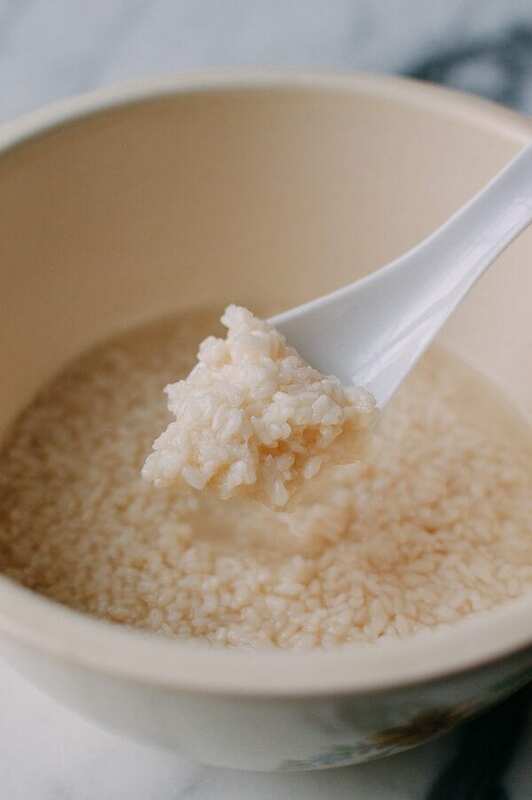 The liquid should taste sweet with a wine-like aroma, and the rice should have the texture of cooked oatmeal. 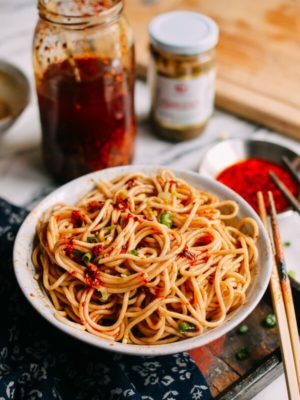 Transfer to the fridge immediately to stop any additional fermentation. Your fermented rice will last for 1-2 months in the refrigerator. 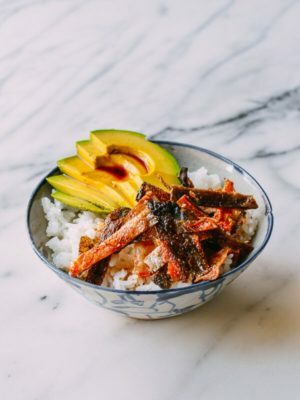 One important note: this sweet fermented rice recipe is very sweet and very low in alcohol levels, so it’s okay for all ages, but NOT necessarily for everyone depending on your health conditions. Please enjoy at your own discretion! 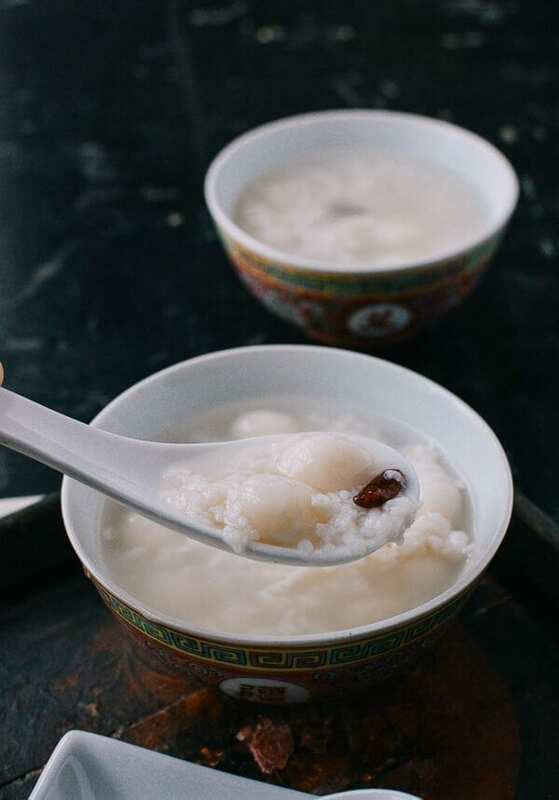 This simple dessert of sweet glutinous rice balls mixed with fermented rice jiu niang is a great dessert to finish any meal. 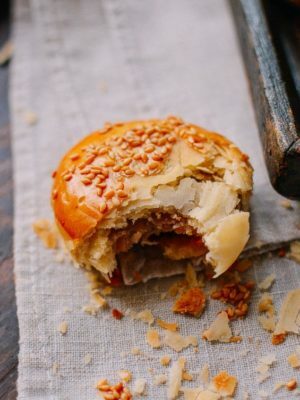 Sweet Fermented Rice, or jiu niang (酒酿), is a versatile Chinese specialty that can be added to both sweet and savory dishes. 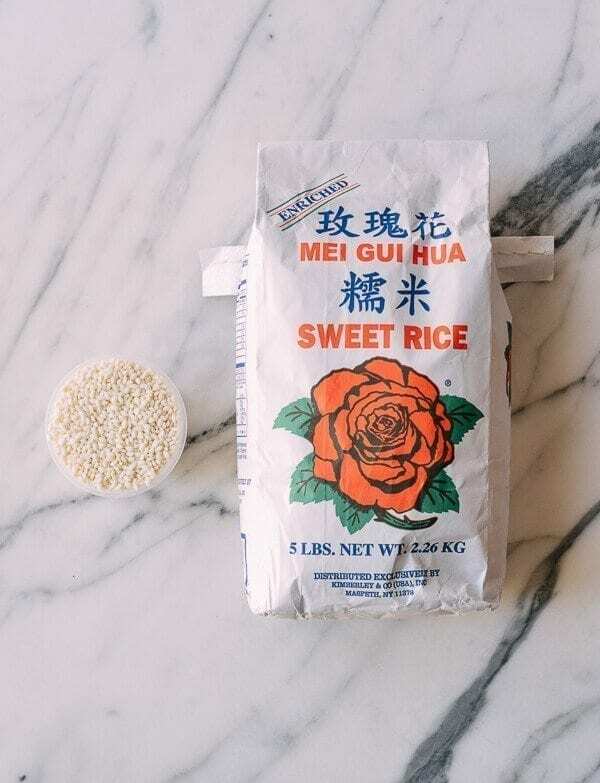 Fermenting rice at home isn't actually that complicated, and it's a great treat for special occasions. 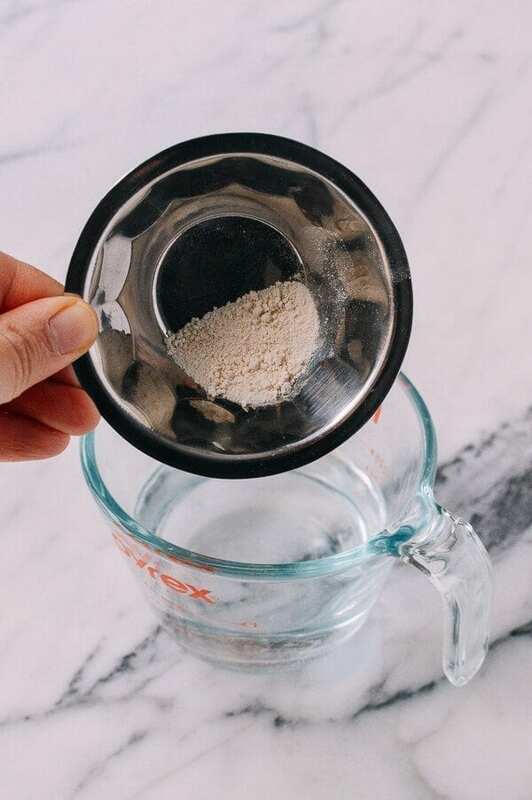 Grind the distiller’s yeast in between two layers of parchment paper with a rolling pin, then mix it in with ¾ cup warm water. 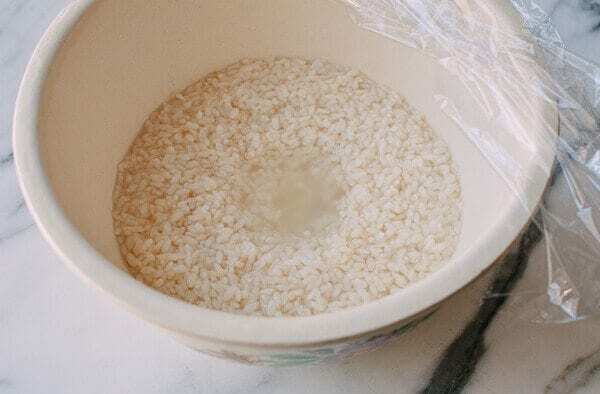 Once the steamed rice is cool to the touch, pour the yeast mixture over the rice. Stir well to combine everything, level out the rice, and create a crater in the center. Hi! I used your recipe once and the rice turned out amazing. However, the second time I tried to make a larger batch, about 8 cups of rice. I measured everything out exactly but around day 5 of fermentation, the rice smelt strange and tasted bitter and not sweet. I’m not sure what went wrong…. 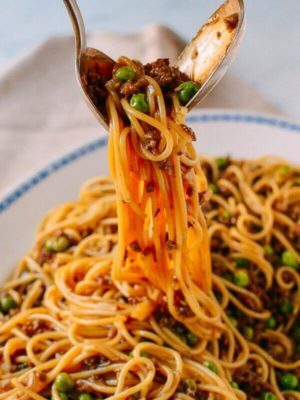 Hi Tracy, the problem might be that some of your utensils or perhaps your container are not clean or not oil-free. Love your blog! It’s like a list of all my childhood favorites, but with measurements! 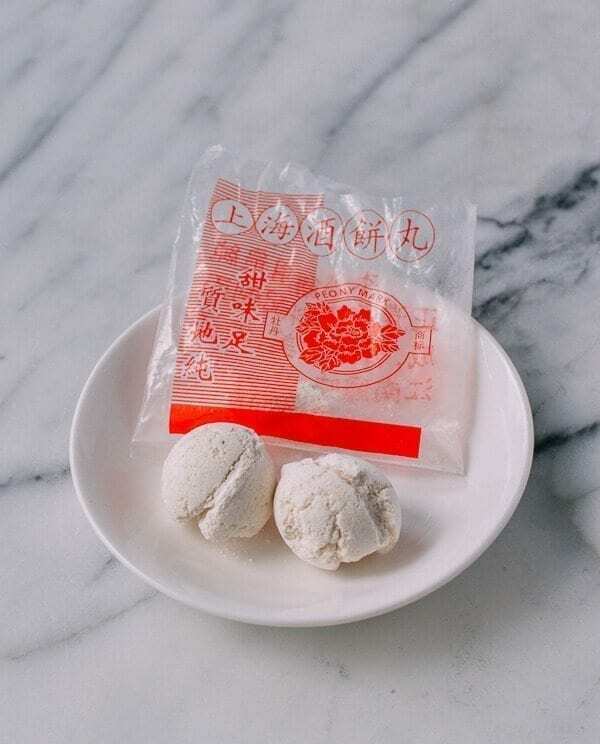 Question for you – how do you serve tang yuan with jiuniang? 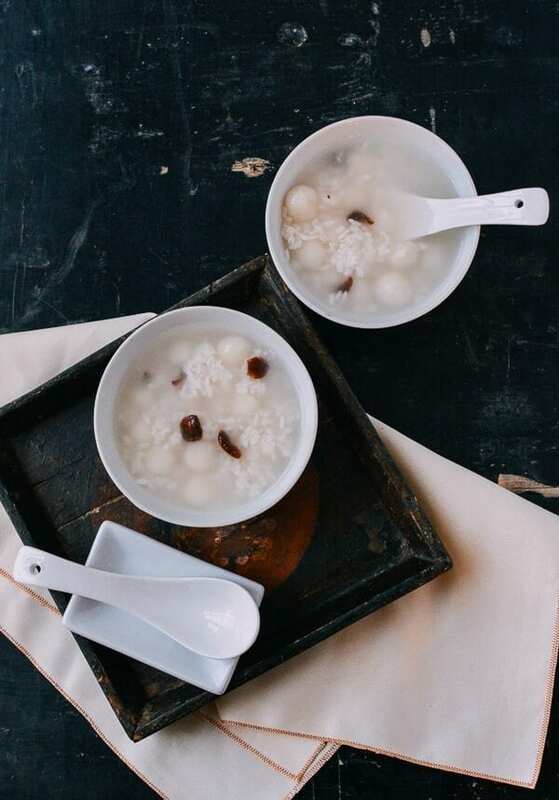 Do you boil the tang yuan separately, then put them into a warmed serving of the jiuniang? 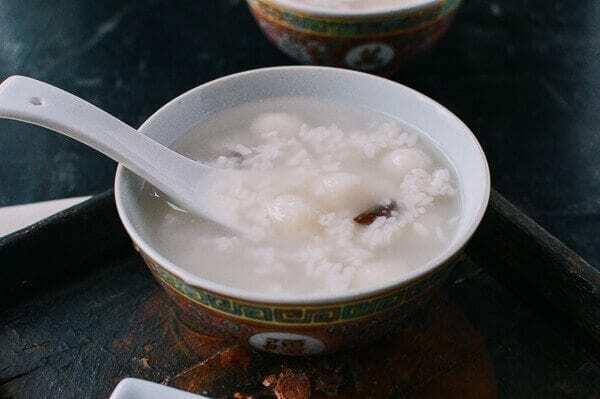 Hi Joy, I usually just add the cold jiuniang to the just cooked tangyuan and its cooking water. 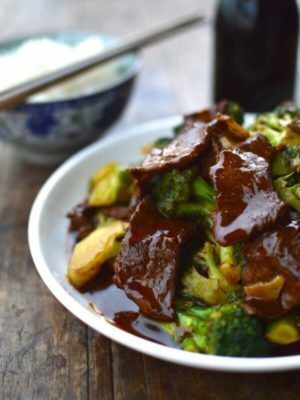 Can’t really cook jiuniang because the rice wine flavor cooks off rather quickly. Can you provide any more detail about the warm temperature that the mixture should be left at? How warm? An auntie of mine put it in the oven with just the light on, but in my cold house this might not be warm enough. I’m afraid of starting my oven during this process out of fear of killing the yeast. Hi David, the temperature should be above 75 Fahrenheit and below 90 Fahrenheit. Lower temperature will take longer, higher temperature will take about a day.